This review is for the Sound Oasis S-550-05 Sound Therapy System , the most popular sound machine of the Sound Oasis brand. 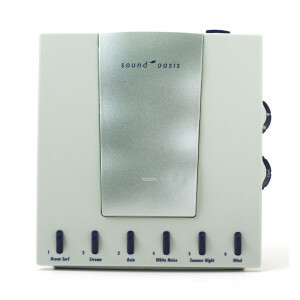 The sounds from this white noise machine are high quality, with an option to add more sounds through a card insert. There have been mentions that the machine is not reliable for some users. The machine is middle of the road for intuitive use. It has a few additional features , like the added memory card, that some customers have a hard time figuring out. Generally the machine can be figured out, but it’s definitely not as simple as other sound machines on the market. The sound selection is fantastic, with many additional sounds able to added through an additional memory card. The standard sounds include Ocean Surf, Stream, Rain, White Noise, Summer Night and Wind. Consumers generally have liked the sound quality as well, noting the loops are not as noticeable as with other machines. , and a battery powered option. The design is very sleek, with an option to mount on the wall or stand alone. It is a bit futuristic, but not overtly so. Generally consumers are happy with the quality of design. The light on the display is very minimal, and will not bother the great majority of sleepers.